Pep Guardiola has admitted he would prefer Benjamin Mendy to "go to sleep earlier" when asked about reports the France full-back was in a Manchester nightclub in the early hours of Sunday morning. Mendy, who missed most of last season with a knee injury, has not featured for Manchester City in the Premier League since November 11 after injuring his knee again. The 24-year-old has been limited to 16 Premier League appearances for City since joining from Monaco for £49.2m in July, 2017 and was again absent as Guardiola's side defeated Fulham 2-0 on Saturday. 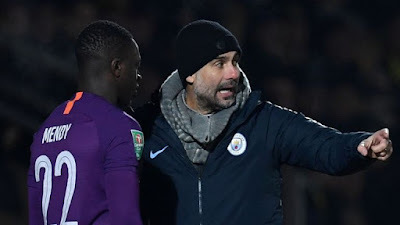 Guardiola, who confirmed Mendy is fit to face Cardiff on Wednesday, a match which is live on Sky Sports Premier League, says it is up to his players to ensure their social lives do not impact their ability to perform on the pitch. "They are old enough to know what they have to do," Guardiola said, when asked about Mendy. "I am not his father. "I would prefer him to go to sleep earlier but I do not control the players in those situations." When asked if Mendy's behaviour exasperated him, Guardiola replied: "No. I am relaxed guy. Maybe it does not look like it but I sleep quite well."